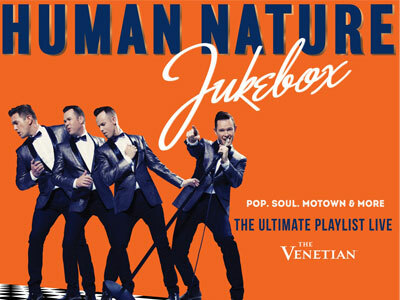 Discounts available on multiple seating types up to $30 off per ticket to see Human Nature at the Venetian Las Vegas. Hurry and book today while the rates are hot! 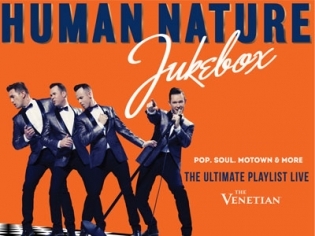 Don't miss Human Nature, Australia’s top selling pop vocal group and popular Las Vegas headliners! This tribute show features Motown classic, Doo-Woop, and modern pop hits like "Uptown Funk." You'll be dancing in your seat! Book your tickets today and save up to $16! Top-selling pop vocal group Human Nature brings a retro and contemporary sound to you at the Sands showroom. This “Jukebox” tour is a playlist of hits from Doo-Wop, Motown, Soul, old standards and recent pop smashes. Their latest multi-platinum album is the influence for this stage performance. Their vocal harmonies have launched the group into popularity and success on the Strip for the past 7 years. With 23 best selling albums in 25 years, the group has a large following and will continue to draw record crowds with this new production. Buckle up for a journey through the ages and through the genres. Then unbuckle because you will be dancing in your seat if not in the aisles. Anticipate everything from “Under the Boardwalk” to “Uptown Funk”.